Inverness Park, Calif. —Pacific Gas and Electric’s campaign to introduce wireless smart meters in Northern California is facing fierce opposition from an eclectic mix of tea party conservatives and left-leaning individualists who say the meters threaten their liberties and their health. Since 2006, PG&E has installed more than 7 million of the devices, which transmit real-time data on customers’ use of electricity…. “It’s not all about saving money — it’s about control,” said Deborah Tavares, 61, a Republican who was arrested this month with other protesters who blocked the driveway of the dispatch center for meter installation trucks in Rohnert Park. Her words echoed those of a staunch Democrat who was arrested in nearby Marin County. “It’s another example of corporate control if they are going to roll over our concerns and not listen to us,” said Katharina Sandizell, 41, who helped block installation trucks in Inverness Park, a hamlet in the environmentally sensitive precincts of Marin County. 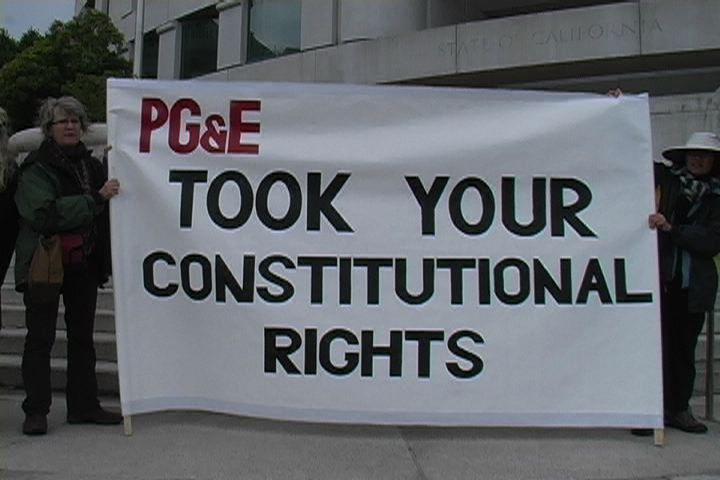 Nina Beety purchased a $4,000 ad in an effort to get PG&E’s SmartMeters banned. A Sacramento area man refuses to let PG&E install a Smart Meter on his house. PG&E changes its tune and says if you absolutely refuse a SmartMeter, your power will not be shut off. Just a couple of years ago, most people had no idea what the Chamber of Commerce did. Aren’t they mom and pop’s small-business lobby in Washington? Now, thanks in large part to the work of Chamber opponents, we’ve come to learn that the biggest business lobby in the world is also one of the biggest impediments to real democracy in the US, and that they’re a huge force in opposing healthcare reform, employee free choice and other labour legislation, veterans’ rights, banking regulations and, of course, transparency. The US Chamber of Commerce is the public face of a corporatism that is hijacking our democracy – and so dramatically limits any chances of meaningful reform. $430 million extra for PG&E per year from customers simply due to the way Wireless smart meters measures kilowatts. KION/FOX TV News did a side-by-side test of new WIRELESS SMART METER vs original ANALOG METER. I am copying below the math from a comment already placed under the article that clearly does the math to extend the three-month difference to one year and sum over PG&E’s 10 million or so customers (involuntary rate-payers). $430 MILLION EXTRA FOR PG$E (paid by you and I). 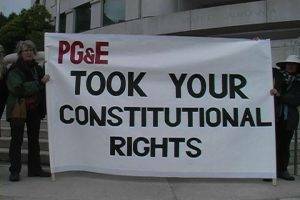 PG&E has about 10 million customers. That computes to $430,400,000 (over $430 million extra for PG$E each year). Nancy Evans writes: Exponent is the science-for-hire consulting firm hired by PG&E to investigate the fires caused by powerline failures and other accidents and to dispute health effects of EMF/RF. In an unusual scenario that raises questions of conflict of interest, a company that conducts research on behalf of the pesticide industry has paid a U.S. government agency to help prove some controversial chemicals are safe. the protest movement, privately claim that there are more corporate spies in protest groups than undercover police officers. The hottest trends in technology also represent some of the gravest threats to corporate data security. Mobile devices, social networking and cloud computing are opening up new avenues for both cyber criminals and competitors to access critical business information, according to speakers at this week’s RSA Conference 2011 at San Francisco’s Moscone Center and a survey set for release this morning. 1. Here is an article which explains the difference between a Smart Meter which collects information for the UTILITY COMPANY and an ENERGY MONITOR which gives the customer Real Time information on electricity usage. PG&E Wireless smart meters do NOT give real time info, so they are near worthless for customers regarding improving their energy usage. Energy Monitors cost from about $40 to over $100 depending on features, etc. PG$E Wireless smart meters cost near $300 and they don’t have the basic feature required for Real Time monitoring of energy use. Smart meters provide energy companies with an accurate meter reading – however, at their simplest level they do not provide any information to the consumer about energy use, cost, or how to reduce energy consumption. For that you need a corresponding energy monitor, which let you track how much energy you’re using in real-time. Our energy monitor review reveals four Best Buy models, and has tips on how to get the most from your energy monitor. 2. At this link, (the energy monitor review) you can see a variety of Energy Monitors and their prices (note prices are in English Pounds). LED products billed as eco-friendly contain toxic metals, study findsUniversity of California – Irvine (2011, February 11). ScienceDaily (Feb. 11, 2011) — Those light-emitting diodes marketed as safe, environmentally preferable alternatives to traditional lightbulbs actually contain lead, arsenic and a dozen other potentially hazardous substances, according to newly published research.